And so another month comes to an end folks! And what an action packed month it was. We got to see the Frost Mascot burst some pipes, saw the Puzzle Mascot best his arch nemesis, twice, I got some super cool business cards, and we even got to hear some really cute music from U900. 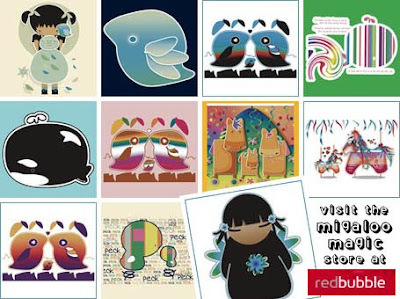 And let’s not forget the great designers and crafters we met along the way - The Happy Box, Elegant Hobbies, Chi Chi Memories, and Migaloo Magic to name but a few. 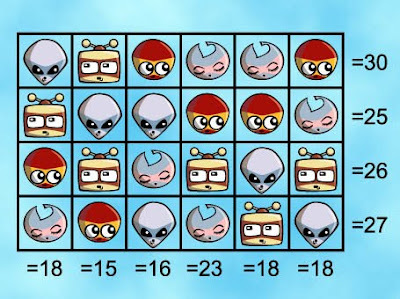 And let’s definitely not forget our monthly puzzle. 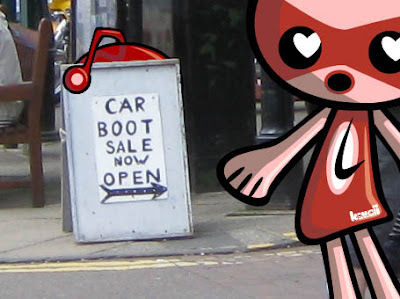 Did you work out who was hiding behind the car boot sale sign? Unbelievable! It was the Mischief Mascot! 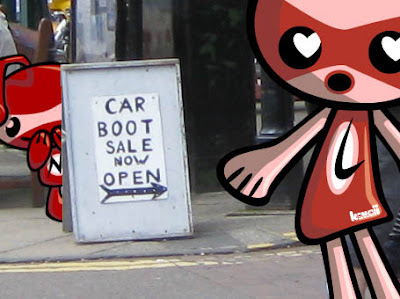 I thought it was going to be the Money Mascot for sure - he just loves car boot sales! Oh well, maybe I’ll have better luck next time! 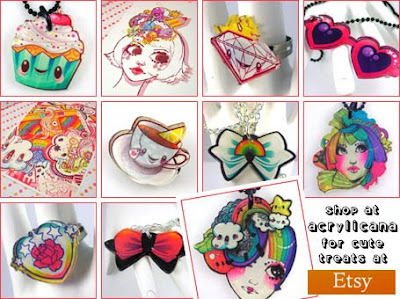 Anyway, be sure to come back next month folks for more kawaii treats, treasures, and crafts! And who knows? 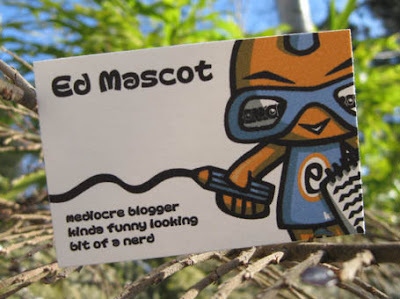 Maybe I’ll even get some more business cards! What? A Mascot can dream, can’t he? See you all in April. Freak Mascot = 3. Doll Mascot = 4. Cubist Mascot = 5. Junior Mascot = 6. Demon Mascot = 7. Please don’t write again. Hurrah! Yes readers, it is true! 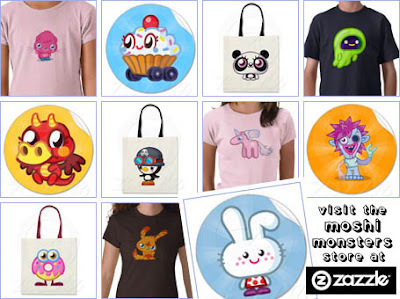 The good folks behind the incredibly cute Moshi Monsters have their very own Zazzle store! Now kids and grown ups alike can have their very own Monsters and Moshlings in the real world as well as the virtual one! Always fancied having a Poppet button? You got it! Been looking everywhere for a Katsuma mug? No Problem! Wanted to get your hands on a Zommer t-shirt? Get in line - he’s my favourite too :) Only joking, there is no line! Double hurrah! Hello readers, nice to see you again! What d’ya mean “who said that?” It is I, your master of puzzles, (despite what some absurdly named amateurs may think! 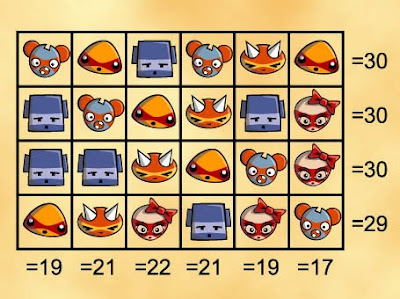 ), the one, the only, the Puzzle Mascot! And what a puzzle I’ve got for you this month! Close your eyes and start counting folks, because it’s time for some good old fashioned hide and seek fun! Ready? Set? Go! As you can see it’s the turn of the Lovestruck Mascot to be “it” - well, she’s always fancied herself as something of an it girl, so why not? Ha ha! But wait, perhaps a more fitting name for this romantic fool would be the Eagle Eyed Mascot! Because it looks as if she’s already spotted one of her colleagues hiding behind that conveniently placed Car Boot Sale sign! The question is… which Mascot is it she’s spotted? Can you help her work it out? The answer, as ever, will be revealed in this month’s monthly round-up! They’re business cards! I know, they are very professional looking, aren’t they? I tailored them specifically for you and mentioned all of your top strengths and skills - mediocre blogger, kinda funny looking, and a bit of a nerd! Perhaps you could use them when you meet influential people to make an immediate and lasting impression. I’m sure I’d remember you if you used one of these beauties on me! See, I told you they were cute :) U900 are couple of Japanese ukulele playing amigurumi characters who like nothing more than rocking out to their own beautiful brand of surf music! And, in the tradition of many a surf band before them, they’re even pretty adept at covering surf classics. The clip above is a cover of Diamond Head by surf legends The Ventures! Pretty cool, isn’t it? And the even better news is that U900 aren’t just an internet sensation! You can actually buy U900 albums and DVDs to listen to and watch whenever you like. Woohoo! Just check out their MySpace page for details! Yep, it’s the cheekiest of all the cheeksters, the cheeky monkey! And now, thanks to the craft-tastic work of Elegant Hobbies, you too can own your very own cheeky monkey! 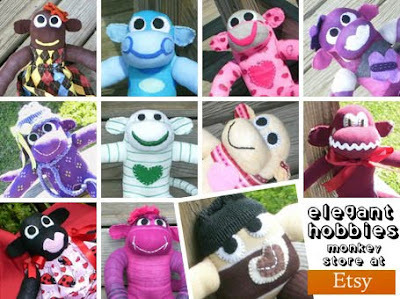 Yes, these spectacular sock monkeys are just waiting for you to come along and snap them up at the fantastic Elegant Hobbies Etsy store! And, best of all, you don’t even need to feed these cute creatures to enjoy their mischievous madness! Just think of the money you’ll save on bananas! 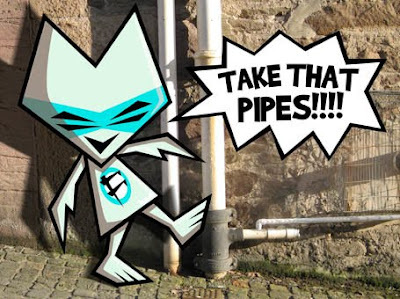 It’s a picture of you getting your Winter funk on and bursting some pipes! I hope it is of some comfort to you, and helps keep you nice and cool over the hot and hard times that are undoubtedly heading our way. And, as I’m guessing we won’t be hearing a lot from you over the Summer, I’d like you to know that you will be missed. Well… at least by some of us! Ginger “Freckles” McRedhead. Aged 33. Thanks Ginger. It’s always nice to hear from a fellow fan of the freeze, and I love the artwork too - it’s so cool! Ha ha! Sorry, I couldn’t resist! 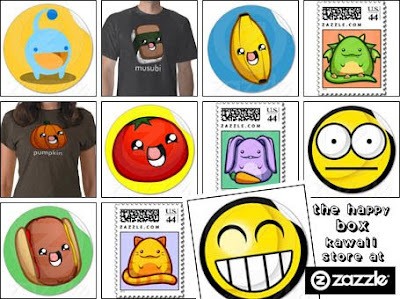 This, my kawaii cohorts, is a box I recently discovered over at Zazzle. It’s called The Happy Box. 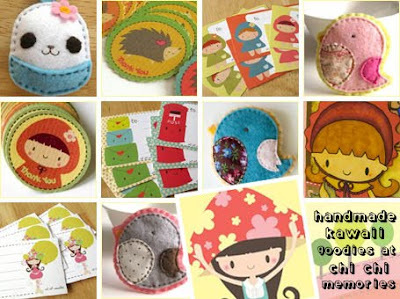 The Happy Box is an amazingly cute shop that’s packed with all sorts of kawaii treats and treasures for us all to enjoy! From dragons to kitty cats and penguins to polar bears this box has it all. So now you don’t have to wait for you birthday to roll around to open up a box. Just head on over to The Happy Box and make everyday your birthday!